Furday is photos on animals in distinctly Canberran locations, because you asked for it! Send your photos of furry (and not so furry) friends to images@the-riotact.com. Harry and Koda with Skywhale. You know, we’ve yet to receive a cat photo, which is surprising with this being the internet and all. Dod Goosepig take his pet swan for a walk? It was a reluctant swan. 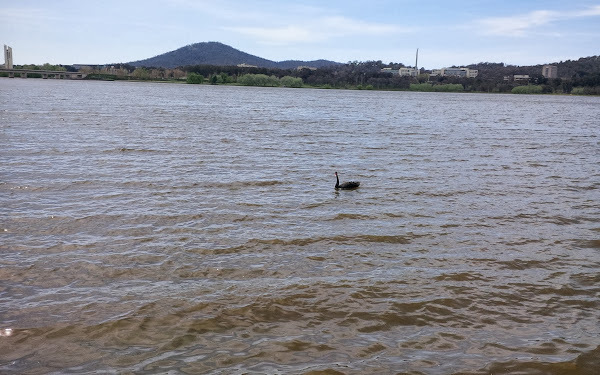 My cat would object, probably quite violently, to having to travel to a notable Canberra landmark just to have his photo taken. Yeah, fluffy bum would do the same. She hates strange places and people and most especially hates going in the box to travel. But you’re welcome to post pictures of her being feline around the house. I have many. Yep, same here. He would give me a face transplant, except forget to replace the face.